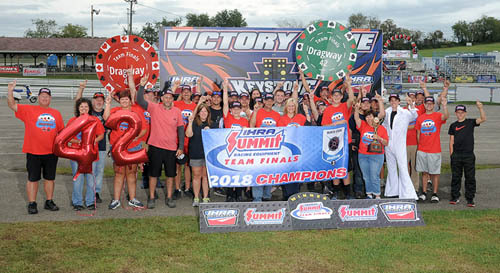 NEW ALEXANDRIA, Pa. - Dragway 42 claimed the championship at the International Hot Rod Association (IHRA) Division 3 (North Stars) Summit Team Finals held over the weekend at Keystone Raceway Park. Leading up to the main event, racers participated in a Gambler's race, Race of Champions race and "best of" awards. 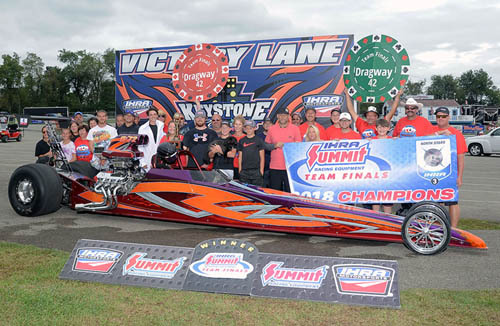 Billy Leasure (Dragway 42) defeated Joe Soucek Jr., (Dragway42) .015 reaction time matching his 4.92 dial-in on a 135.71 mph run. Soucek Jr. had a .004 reaction time and went down the track with a 6.08 second pass at 113.90 mph. 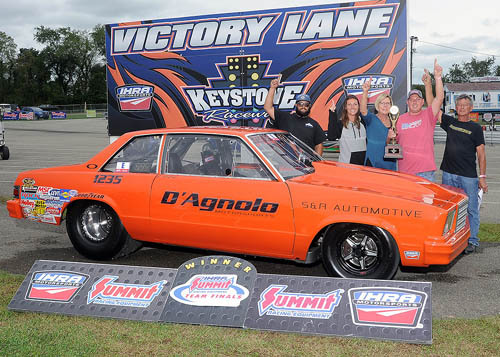 Pete D'Agnolo (Empire Dragway) claimed the top prize with a .023 reaction time 5.99 second run at 110.84 mph. Runner-up Ryan Ricketson (Lancaster National Speedway and Dragway) went down the track with a .018 6.36 second pass at 108.02 mph. 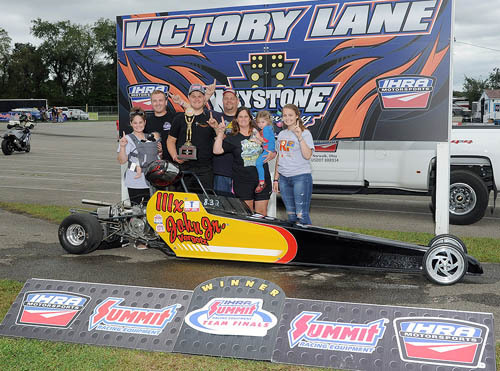 Matt Powell (Keystone Raceway Park) matched his dial-in of 8.27 and defeated runner-up Rick Poole (Quaker City Motorsports Park) with a .092 reaction time 8.27 second pass at 84.78 mph. Poole had a ..066 reaction time with a 5.73 second pass at 117.46 mph. Top - A.J. Casper from Jeanette, Pa., 7.38 on a 6.93 dial-in, .006 reaction time defeated Schulyer Turner from Fostoria, Ohio, 7.14 on a 4.78 dial-in, -.003 reaction time. Mod - Russell Terrill of North Benton, Ohio, 6.44 on a 6.44 dial-in, .031 reaction time defeated Jeff Jacko of LaGrange, Ohio, 6.96 on a 6.95 dial-in, .045 reaction time. Junior - Cadance Soucek of Rittman, Ohio, 9.02 on an 8.95 dial-in, .044 reaction time defeated Blake Molnar Hinckley, Ohio 7.98 on a 7.95 dial-in, .106 reaction time. Bike - Matt Powell from New Alexandria, Pa., 8.27 on an 8.26 dial-in, .077 reaction time defeated Dave Carpenter from Duncannon, Pa., 6.00 on a 6.00 dial-in, .110 reaction time. 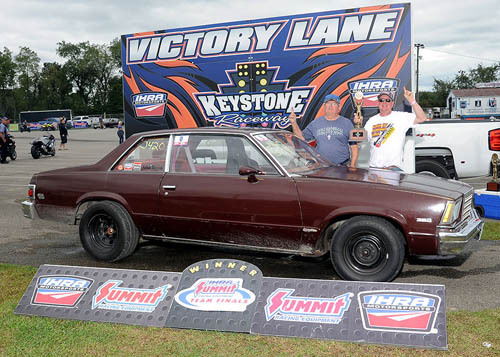 Top - Steve Lenig (Beaver Springs) 4.91 on a 4.91 dial-in, .049 reaction time defeated Mike Lynd (I-64 Motorplex) 5.82 on a 5.83 dial-in, .023 reaction time. Mod - Niki Thomas (Keystone Raceway Park) 6.41 on a 6.40 dial-in, .018 reaction time defeated Rob Baab (Thompson) 6.77 on a 6.77 dial-in, .027 reaction time. Junior - Kyle Hughes (Quaker City) 8.14 on an 8.09 dial-in, .033 reaction time defeated Aiden Mackert (Beaver Springs) 12.17 on a 12.18 dial-in, .035 reaction time. 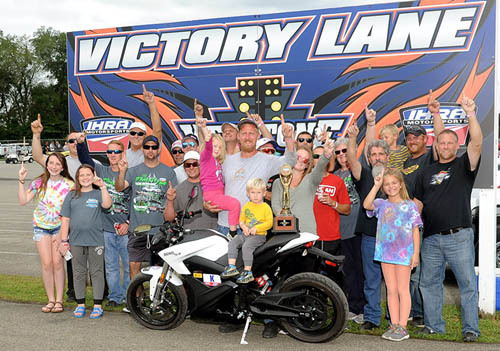 Bike - Dave Carpenter (Beaver Springs) 5.95 on a 5.93 dial-in, .071 reaction time defeated Paugh Perry (Dragway 42) 5.12 on a 5.14 dial-in, .112 reaction time.